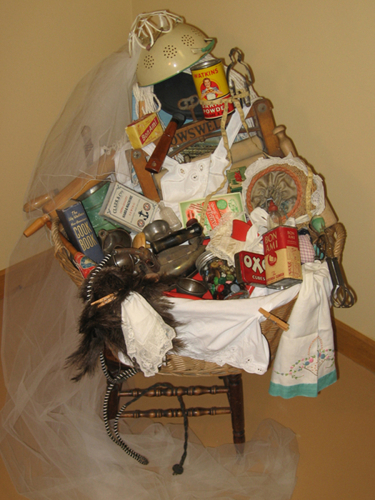 "Luckiest Girl in the World"
This is an installation piece which has been put together with vintage objects relating to "housework". The work represents a naive bride whose wedding gown ultimately turns into a maid's uniform. The idea for this piece comes in the form of a protest piece. It is titled "The Luckiest Girl in the World" as this is what my husband calls me anytime I complain about not having enough time to pursue my creative endeavors.